This fuzzy file from Wikipedia is the only image I’ve seen for this painting by Peter Kobler von Ehrensorg (1746), but the delight here is not the details, but the unbridled luxury of the design. The two figures float on a field of black and near-black. The emperor almost disappears into a flurry of red and orange middle tones, which are repeated less vividly on the empress’s side. She leaps out, brightly contrasted with the inky surrounds of background and her gown. His large area of middle tones interweaves with her smaller area of brights; the predominant darks and whites on her side are picked up in small, sharp bits on his costume. Those sorts of contrasts and repetitions are common enough in complex paintings. What sets this piece apart is both the richness and subtlety of the colors and the surrealistic liveliness of their costumes: dancing, billowing ribbons, full of variety from one side to the other. 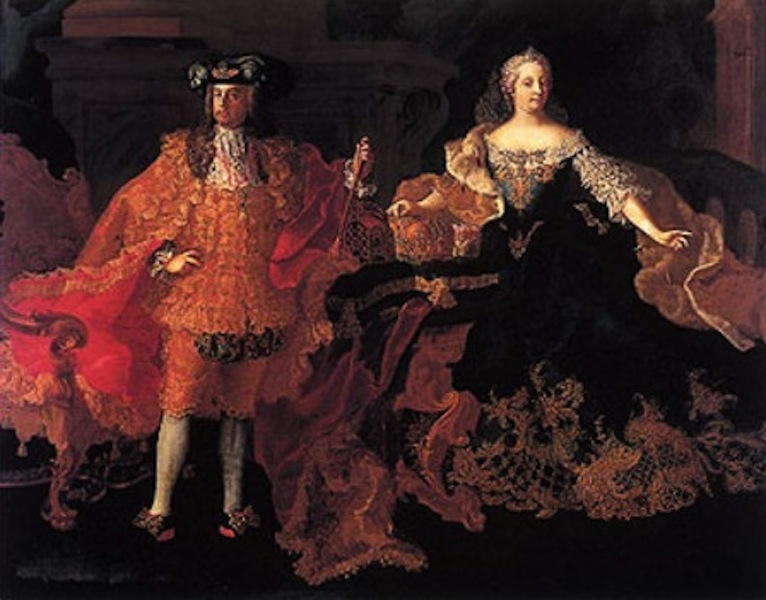 Francis I, Holy Roman Emperor and Grand Duke of Tuscany, and Maria Theresa, Empress Consort of the Holy Roman Empire, Queen Consort of Germany. Even that wonderful chair plays in. For fun, start with the trim of his robe where it is flipped inside-out across the chair. It rises from the arm of the chair, floats (defying gravity) up to his chest, then curves back over his shoulder. It reappears on the other side, dives under that rich if unconvincing inside-out bit coming down from his left arm, appears again below his scepter and wiggles down to the floor. There it gets entangled with what may be more robe or may be something else, but which in any case delivers the eye to the amazing soft orange trim of her gown, which, although low-key, seems bright because it is contrasted with the intense black of gown and floor, and carries us all the way to the right edge of the composition—where the eye is caught by the brighter, firmer body of her robe above, which carries us up, across her whole upper half, and presently back to his left hand. And so on. 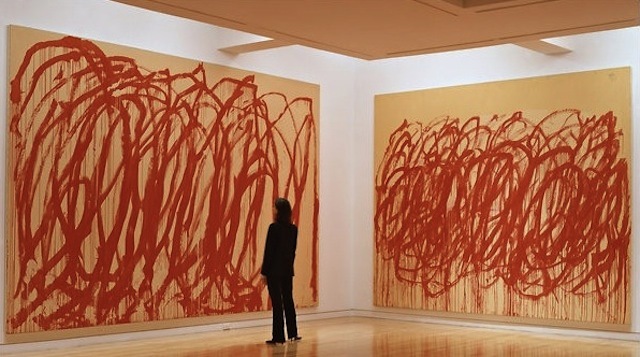 Cy Twombly would play similar games, not without richness and resource, but without the playfulness or the surprise.